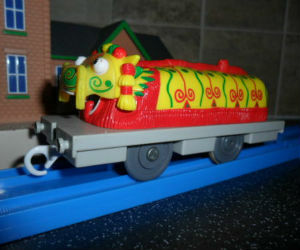 The TOMY Chinese Dragon Trackmaster is brightly colored and very unique. He was originally delivered to the island of Sodor for a special carnival by way of flatbed. He is actually made of paper so he must be carried with care when he is delivered. This toy train was made by both TOMY and is no longer manufactured; however, you still can find them both new and used. The Chinese Dragon is extremely unique with its bright colors. This toy is seldom seen and makes a welcome addition to any collection. Charles and Adam’s Auntie Annie is from China so this train has special meaning for them. For the Thomas and Friends book collectors, this is a wonderful book at Thomas and the Chinese Dragon called Thomas and Percy and the Dragon Book. This is a great story about how Percy awoke to see this colorful Giant Yellow Dragon. The toy was sold in two variations. 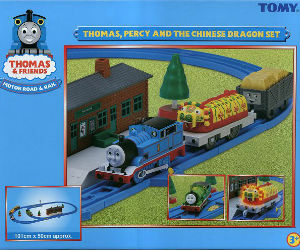 One package was called Thomas and the Chinese Dragon which included the Chinese Dragon, one Troublesome Truck and a motorized Thomas. Note this toy must be pulled as it does not have batteries. 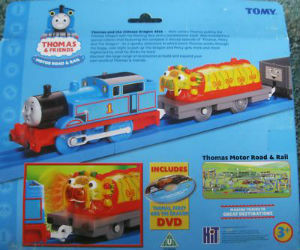 This was also packaged as Thomas, Percy and the Chinese Dragon Set, which included the Chinese Dragon, a motorized Thomas and a motorized Percy with DVD. Also, in Japan this was sold as Japanese Plarail Thomas Percy and the Dragon Set with DVD. These are somewhat rare toys but the good news is that they are not very expensive.